Four students from Oldfield Middle School in the Harborfields Central School District have been selected as Local Honorees of the Prudential Spirit of Community Award. Seventh-graders Violet Fava, Sophia Casillo, Madeline Barker and Kaitlyn Wille, who are dedicated to bettering and serving their community, were recently awarded with a Certificate of Merit by the organization. This youth-recognition program chooses recipients solely on volunteer and community service, and is the largest in the country. These students have volunteered heartfelt effort and many hours to Maggie’s Mission, which is a foundation formed by a Harborfields family in memory of a their daughter and Harborfields student Maggie Schmidt. 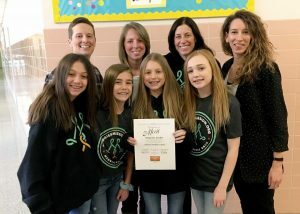 Together, the girls wrote an essay explaining how they accomplished raising $1,185 for pediatric cancer research for the foundation by going door to door in the community. They initiated this project through a schoolwide fundraising effort, which was spearheaded by teacher Mrs. Jennifer Garside. Photo caption: Oldfield Middle School students (l-r) Violet Fava, Sophia Casillo, Madeline Barker, and Kaitlyn Wille were recently selected as Local Honorees of the Prudential Spirit of Community Award for their dedication to Maggie’s Mission.